As shown in the figure on the right, water consists of a cluster of water molecules. Each water molecule is made up of two hydrogen atoms and one oxygen atom, and each atom comprises a nucleus and electrons that surround the nucleus. Furthermore, the nucleus consists of protons and neutrons. This hierarchical structure is not limited to water but also applies to all physical matter on Earth. In fact, all physical matter surrounding us, including our bodies, is made up of nuclei, and the 99.7% of the weight of physical matter is that of nuclei (remaining 0.03% of the weight is made up by electrons). In fact, they are all nuclei. The nucleus has different properties. For example, it can take several different shapes, not only a spherical shape but also a lemon- or tangerine-shape. Some even predict the existence of more extreme shapes, such as a banana- or pear-shapes, although none of these have been discovered. The RIBF is a facility to conduct research on such undiscovered nuclei. 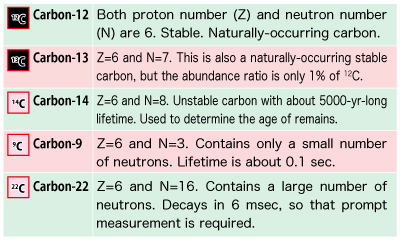 The universe is made up of protons and neutrons　— What is a table of nuclides? How many kinds of nuclei exist in the universe? Is it 100 or 1000? 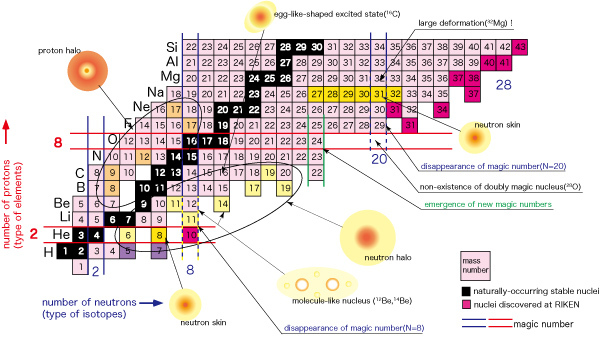 In fact, it is believed that there are about 10,000 types of nuclei, which are depicted in the following figure. Each small cell represents a nucleus (the cell boundary is omitted for yellow, pink, and light blue areas). Let’s zoom in on the table. The figure on the left shows a close-up view of the lower left section. Keep in mind that a nucleus is made up of protons and neutrons. 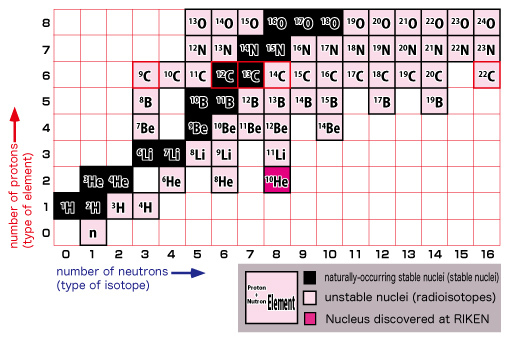 The vertical axis indicates the number of protons (type of element) and the horizontal axis shows the number of neutrons (type of isotope*). As you can see from the zoom-in view, common elements such as hydrogen, helium, lithium, beryllium, and etc. are placed in the familiar order from the bottom. As we move up from the bottom to the top, notice that the arrangement is identical to that found on a periodic table of elements. Each horizontal line indicates an identical element. A table of nuclides can be viewed as a detailed version of the periodic table of elements. 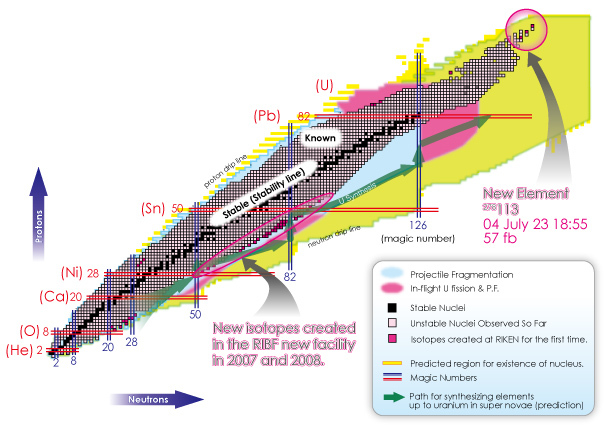 You can see virtually all nuclei including undiscovered ones at a glance in a table of nuclides. Let’s take a closer look at this table by focusing on carbon. In the upper figure, look at the carbon nucleus (C) with a red border. The number of types of naturally-occurring stable nuclei is less than 300. A stable nucleus is made up by the nearly equal numbers of protons and neutrons. It is the nucleus’s characteristic that an alteration of only one proton or neutron will drastically change the property of the nucleus. It is predicted that there are numerous types of nuclei, but many of them have been predicted theoretically but have not been actually discovered yet. The RIBF has discovered a theoretically predicted nucleus. At RIBF, researchers aim to detect theoretically predicted nuclei and determine their lifetime, mass, size (radius), and shape using detectors dedicated for the respective measurements. Such a world’s-first discovery (observation) is an important role of RIBF; however, our true goal is to elucidate the mysteries in which various states of nuclei are manifested only via the combination of two types of particles (protons and neutrons). Recent studies conducted at RIKEN have revealed that there are many nuclei with anomalous nuclear structure such as a neutron halo and neutron skin in the region near the neutron drip line, where neutron-rich nuclei are located. It has also shown for the first time that a magic number of 20 loses its magic feature (supposed-to-be spherical shape is deformed and nuclei that are supposed to exist do not) in this region. None of these phenomena are expected based on the existing view of nuclei (existence of magic number, deformation of nucleus when being away from magic numbers, identical intra-nuclear distribution shapes of protons and neutrons — established by the three Nobel prize studies from the 1950s — the shell model, the collective motion model, and the measurement of charge distribution.